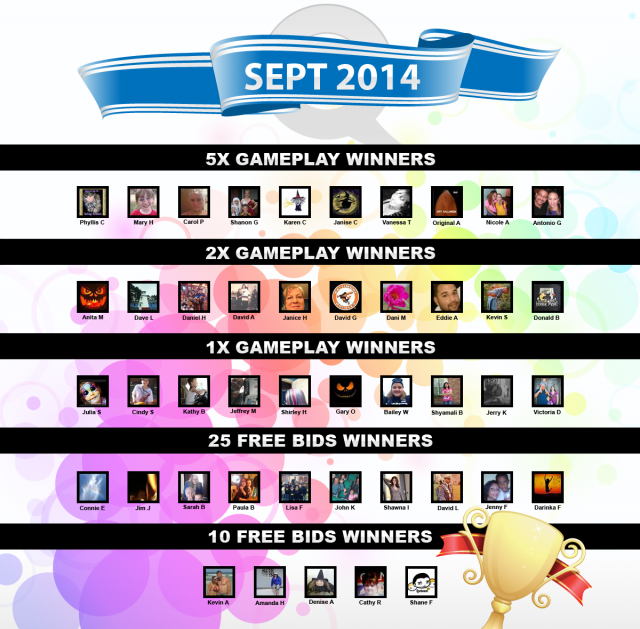 Congratulations to the September 2014 Top QuiBidders Winners! September is officially in the books, and before we get super spooky for the month of October (some fun things are coming btw), we wanted to take a moment to recognize the Free Bids and Gameplay winners from September. Below are a list of the winners. Each of these bidders won rewards for their contributions to the QuiBids community on Facebook. Go here to learn how you can earn points to move up the leaderboard and win rewards like these people. Be sure to congratulate the winners in the comments below! Here are some of the top community posts from September. QuiBidder of the Week – Shirley H.